“It’s pretty dramatic, but we have pretty good handle on it,” she said. “It’s complicated,” Hayes-White said of stopping the flow of gas through the damaged pipe. PG&E, which is under heightened scrutiny over its gas pipelines, didn’t immediately return a phone call seeking comment. 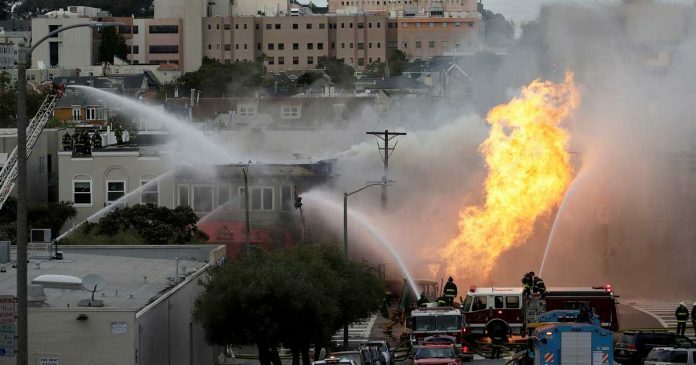 A U.S. judge fined the nation’s largest utility $3 million for a conviction on six felony charges of failing to properly maintain a natural gas pipeline that exploded under a neighborhood south of San Francisco in 2010. The explosion killed eight people and wiped out a neighborhood in suburban San Bruno. California regulators also fined PG&E $1.6 billion, and the utility remains under a federal judge’s watch in that case. Wednesday’s fire began shortly after 1 p.m., apparently by crews working on fiber-optic wires, Hayes-White said. “I anticipate the gas line was breached by the workers,” the fire chief said.